DENPASAR/BURU ISLAND, Indonesia — Illegal online mercury sales are booming in Indonesia, and activists have had enough. “Nearly all the mercury players in Indonesia do their business illegally,” says Yuyun Ismawati, a Goldman Prize-winning activist and founder of the environmental NGO BaliFokus. Use of the toxic metal was banned in 2014, but it remains popular among small-time miners, for whom it’s become increasingly easy to procure online. At least 60 sellers are currently running either on social media or on popular e-commerce sites Shopee and Bukalapak, according to local campaign groups. And little is being done to stop them. 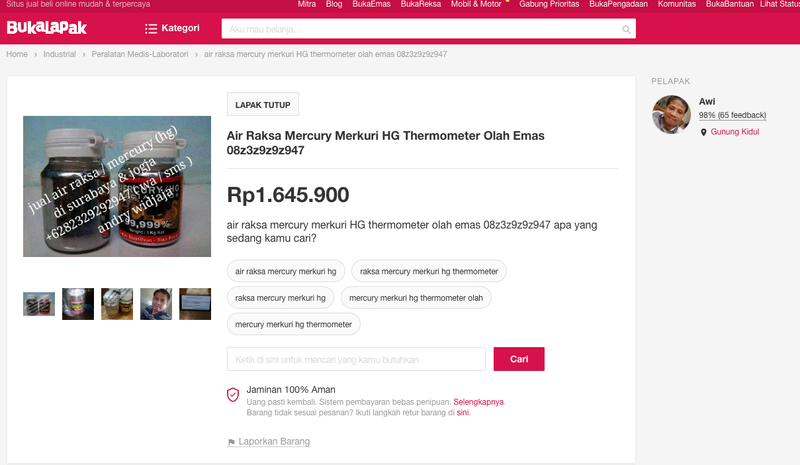 A screenshot of a bottle of mercury for sale on the e-commerce site Bukalapak, taken on Feb. 18, 2019. Awi’s buyers are typically poor families living in mining hotspots like West Java province or the island of Lombok. These families mix the mercury with gold-flecked ore to create a mercury-gold amalgam, and then use fire to vaporize the mercury away, leaving behind just the gold. Whether by touching it, drinking water contaminated with it, or inhaling it in vapor form, exposure to mercury damages the nervous system, triggering memory loss and compromising cognition, among other impacts. In children, exposure can cause birth defects and developmental delays, even mental retardation. Ismawati estimates 100,000 to 200,000 Indonesians suffer from mercury poisoning, with another 10,000 to 20,000 children experiencing birth defects from exposure in the womb. A worker examines ore for signs of gold in Cisitu, West Java. Image by Donny Iqbal for Mongabay. Environmentally, discarded mercury residue flows through watersheds into rivers, settling into sediment and contaminating the water and organisms that feed in the soil. In a study of one mining village on the island of Lombok, 94 percent of childbearing women had mercury levels in their bodies higher than the internationally recognized safety threshold of one part per million. An ongoing gold rush on the eastern Indonesian island of Buru provides a stark picture of the impacts. On the slopes of Mount Botak there, thousands of illegal miners and other entrepreneurs are camped out in blue tarpaulin tents. Local residents have grown fearful of eating locally grown produce and are having to import drinking water from the main town nearby. Fishermen can’t sell their tainted fish. Livestock have dropped dead from mercury and cyanide poisoning. “I am very worried because the place where our cows look for food has been contaminated with mercury and cyanide,” said Istahhoni, a local rancher. Cyanide is another heavy metal popular among small-scale miners. 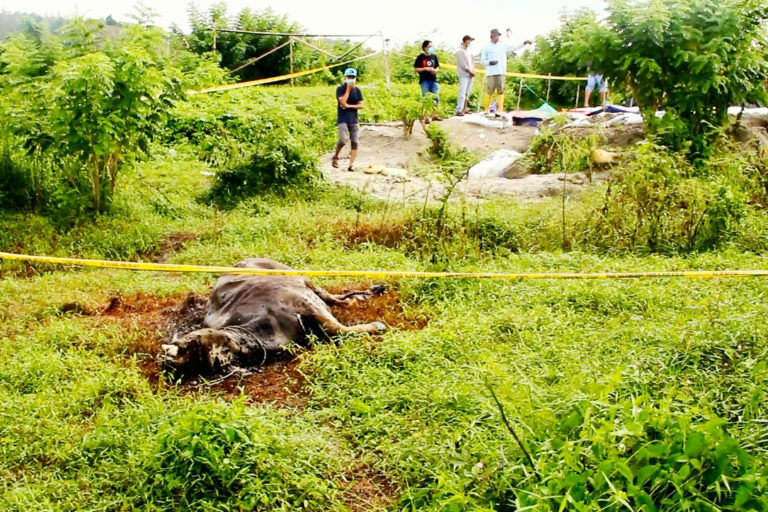 A dead cow in Dava village on the island of Buru, near the illegal mining encampments. 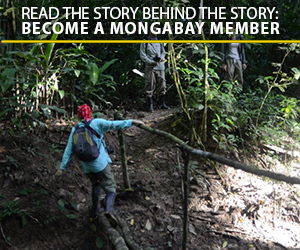 Image by Nurdin Tubaka for Mongabay. For hundreds of families, daily food and water needs are no longer locally sourced, creating financial restraints likely to drive them deeper into poverty. Local leaders have called for the authorities to shut down the encampment, but the mining has continued apace. Two years ago, Indonesia joined 128 other nations in signing the Minamata Convention on Mercury, an international treaty that aims to eliminate mercury pollution and phase out its commercial use by 2020. Activists, however, say progress has been slow. 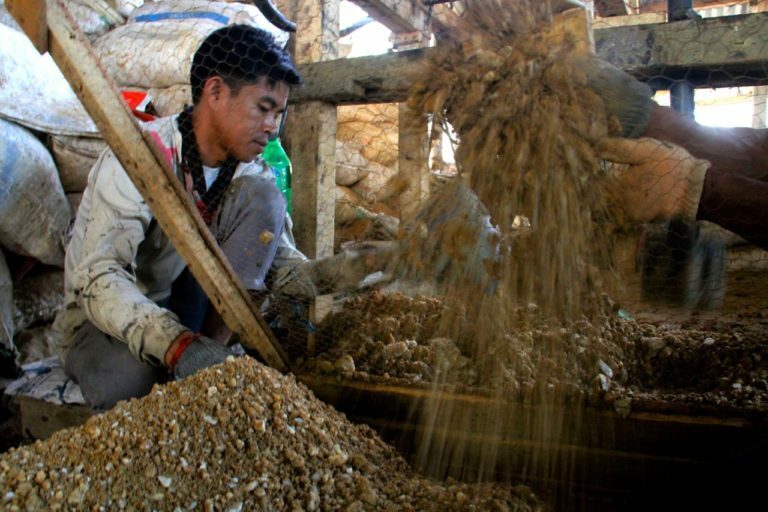 Margaretha Quina, a researcher with the Indonesian Center for Environmental Law, says the lack of regulations around mining of cinnabar — the globe’s only significant ore for mercury — is a major obstacle. “There aren’t any laws specifically aimed at cinnabar, despite the fact that mercury is derived from this basic material,” she says. The recent discovery of new cinnabar deposits in Indonesia hasn’t helped matters. It’s made mercury cheaper and more widely available, helping fuel illegal mining. According to Prigi Arisandi, director of the Indonesian environmental NGO Ecoton, not only does cinnabar indirectly lead to mercury pollution. The very act of mining it can cause mercury to leach into surrounding environment. Indonesia isn’t the only place where small-scale gold mining — and the attendant mercury pollution — is on the rise. According to the Intergovernmental Forum on Mining Minerals, Metals and Sustainable Development, more than 40 million people across the globe currently work as small-scale gold miners, up from just 7 million in 2013. In Indonesia, the boom has fomented a public health emergency. This story was reported in part by Mongabay’s Indonesia team and was first published on our Indonesian site on Jan. 23, 2019.